Who among us has not felt that sick, empty feeling in the gut upon realizing that a dream we have pursued with all intensity, is not going to materialize? Who does not know that feeling of disappointment – even despair – when after doing everything right and perfectly, the dream job you have been chasing is awarded to your boss’s son-in-law? Or someone with absolutely no work experience, but a fancy MBA from a top university? How many of us have been lucky enough to escape the harsh reality and numbness that accompanies an absolute sure thing that turns out to be not so sure after all? The answer is very few of us get through life unscathed and undamaged. Most of us know what it’s like to be kicked in the belly. To be knocked down so hard that just the thought of getting up is overwhelming. To be so utterly defeated that any attempt at recovery seems futile. And so, the question becomes what do we do at those times? The answer lies in our habits. What have we, through practice and repetition, trained ourselves to do when defeat is looming, hope seems lost and disaster seems inevitable? Among us there are those who, in these moments, always pick themselves up – bruised and bloodied – stand up straight, push their shoulders back, set their jaws firmly and go back into battle with even more determination and resolve. They live their lives with a simple credo: I get knocked down, but I get up again. Nothing’s ever going to get me down. I will always get up. These are the folks we read about in magazines, see being interviewed on television and who frequently deliver messages of inspiration to sold-out audiences. They are the role models we should all aspire to become and yet, among us are many who, once knocked down, stay down, defeated and ready to surrender. Those who do so have lost all sight of the prize they were seeking and the joy it would bring and shifted their focus to the short-term, intense pain they are experiencing. And they are hard at work convincing themselves that the short-term pain of defeat is not worth the long-term pleasure of victory. The Habit of Always Getting Up is one worthy of adoption. 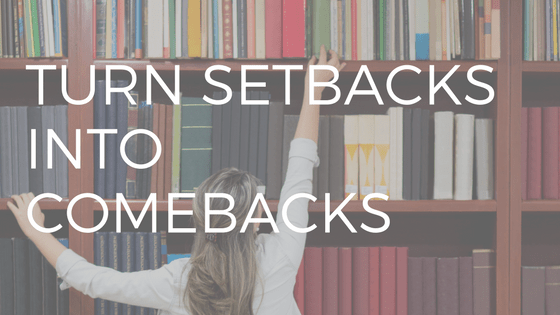 Admittedly, getting back up and continuing the fight often requires every ounce of reserve and sometimes just the pain of getting back can be enough to deter even the most determined. In my work, I’ve had the privilege of meeting and working with people who have had to overcome near insurmountable adversity in order to be where they are today. I have listened, riveted, to their stories of what they did to turn disaster into victory. I must say each time I hear such a story I become more convinced that if indeed there truly is a secret to life it is this: success and accomplishment is achieved not by those most skilled, most talented and most capable, but rather by those who have learned to master their emotions. It is the mastery of emotions that energize us to get up off the floor, patch ourselves up, go back into battle and keep doing this over and over until victory is ours. Regardless of whether the challenge is one of health, career, competition, finance, relationships or anything else, The Habit of Always Getting Up empowers us to feel the future pleasure of success and thereby energize us to never give up. I could fill volumes relating the stories of many folks I have met who have moved from indescribable despair to enviable reward by staying true to The Habit of Always Getting Up.